Snugg iPad mini case. Condition is New. Shipped with USPS Priority Mail. Protect your iPad in style with the premium Snugg iPad 3 & 4 PU leather case. Made from the highest quality PU leather with a soft untuck fiber interior it will protect your iPad from scratches and scrapes. Snugg Fit For Life Ipad2 Case. Condition is New. Shipped with USPS First Class Package. Snugg | IPad Case . Condition is Used. Shipped with USPS Priority Mail. Snuggle iPad 11 Keyboard Case. Condition is Used. Shipped with USPS Priority Mail. Excellent condition, owned 4 less than a week. Slight signs of use. Selling because ultimately my hands are too big to type on it LOL. Includes USB c charging cable See the pictures. Can rotate, lie down flat so you can use as a tablet or as a mini notebook. a variety of viewing angles to choose from to enjoy your iPad pro 11 with. Snugg 360 Keyboard Case With Bluetooth Connectivity For Apple IPad Mini 1/2/3. Condition is New. “Cosmetic damage on the box product, as you see.” Shipped with USPS Priority Mail. Snugg iPad 2 Leather Case & Flip Stand - Hold Stylus & Cards - Rare White Color! Protect your iPad in style with the premium Snugg iPad 2 PU leather case. Made from the highest quality PU leather with a soft untuck fiber interior it will protect your iPad from scratches and scrapes. New Snugg Leather Flip Stand Case for Apple iPad PRO available in black and pink colors. Snugg Quality. Quality Apple iPad AIR 3.0 Bluetooth SMART Keyboard Blue 9.7" devices. IPad Pro 12.9 2017/2015 Keyboard, Snugg [Blue] Wireless Bluetooth Keyboard Case Cover 360° Degree Rotatable Keyboard for Apple iPad Pro 12.9 2017/2015. Bluetooth interface with long battery life. Fits the iPad Pro 12.9 2015 perfectly with sleek and stylish design. iPad Pro 12.9 2017 and 2015 Case, Snugg Leather iPad Pro 12.9 2017 and 2015 Ca..
IPad Pro 12.9 2017 and 2015 Case, Snugg Leather iPad Pro 12.9 2017 and 2015 Case Cover Protective Flip Stand Hot Pink for Apple iPad Pro 12.9 2017 and 2015. Manufacturer: Snugg. REFINED LUXURY: The smooth, nubuck fibre interior provides a comfortable cushion for your tablet's precious screen. Used, like-new condition. Comes with charging cable and wall plug. Specially designed for the iPad 2, (A1395, A1396 or A1397) with precise cut-outs and openings for easy access to all of the ports and features. Automatically wakes and puts the iPad 2 to sleep. Soft and protective premium nubuck fibre interior. We will reply as soon as possible. Hours: We are available Mon to Sat 9 am to 6 pm. iPad Air 2 360 Rotatable Keyboard Case, Snugg - Ultra Slim Keyboard Case. Condition is Used. Shipped with USPS First Class Package. It has a stand and a pen holder attached. It is made for an ipad 1. Snugg iPad 1 Case, Green Leather Smart Case Cover Apple iPad 1 Protective Flip.. Protect your iPad in style with the premium Snugg iPad 1 PU leather case. Made from the highest quality PU leather with a soft nubuck fiber interior it will protect your iPad from scratches and scrapes. Design, material, construction etc. UK Snugg unique quality. With opening and closing of the lid, iPad 3 & 4 will automatically start up and go to sleep. Unique to United Kingdom Snugg design, materials and build quality. Has been cut to Apple iPad 2 (see picture 2 type) design is perfect, easy access to all ports. Opening and closing of the lid in the iPad 2 will automatically up and sleep. This case uses outer PU synthetic leather, high quality soft nubuck and protects iPad 4 & iPad 3 from scratches and shocks. Also the inside Velcro fastens the iPad 4 & iPad 3 body securely, so the body will never be displaced. Unique to United Kingdom Snugg design, materials and build quality. Has been cut to Apple iPad Pro (see picture 2 type) design is perfect, easy access to all ports. Also missing is the body off the Velcro strap inside the iPad Pro securely, so. Size: iPad 2 | Color: Baby Blue. It will arrive in 1-4 weeks. It will arrive in 2-4 weeks. The manufacturer will change contents, date and quantity for sale. [ Release Date(yyyy/mm/dd) ]. Japan Usage Item. Looking forward to your orders! [ Note : Pre-Order (P/O) ]. We do our best for you!! Unique to United Kingdom Snugg design, materials and build quality. Apple iPad 3 & has been cut to 4 (see picture 2 type) design is perfect, easy access to all ports. Opening and closing of the lid in the iPad 3 & 4 automatic upright and sleep. Japan Usage Item. the manufacturer will change contents, date and quantity for sale. Looking forward to your orders! [ Release Date(yyyy/mm/dd) ]. We do our best for you!! Snugg Bluetooth Keyboard Case for iPads 10.5"
New Snugg bluetooth keyboard case for iPads 10.5" in open original box. Unique Snugg obsessed with all of the features, design and material quality. designed to snugly fit the iPad Pro 9.7. Access to all ports. Keyboard is in great condition. The only defect is a tiny crack in the cover near the on-off switch, which has been repaired with super glue (see last photo). Otherwise it's perfect and works great. Unique to United Kingdom Snugg design, materials and build quality. Apple iPad Mini & Mini 2 (see picture 2 type) design so you can easily access all ports are cut. Opening and closing of the lid in the iPad Mini & Mini 2 automatically up and sleep. Unique to United Kingdom Snugg design, materials and build quality. Opening and closing the lid on the iPad3 & iPad4 up automatically, or to sleep. SNUGG Grey Leather All in One Case Cover & Stand. Made for the ipad 1. Grey in Color. Apple iPad AIR 2. RED N WHITE keys Bluetooth Keyboard rigid plastic. Apple keyboard short cuts. 360 Degree Rotating Screen. 9.7" device. SMART COVER. AUTO WAKE N SLEEP. For Apple Ipad Air with 360 degrees rotating SMART screen in rigid Black plastic. Preowned Snugg Bluetooth Keyboard. ALSO WORKS WITH IPAD AIR 2. AUTO WAKE / SLEEP SMART CASE. Works great ! Unique Snugg obsessed with all of the features, design and material quality. Snugg seeking style and features Air ipad2 for PU leather case. That is why the Snugg. designed to snugly fit the iPad Pro 9.7. SNUGG iPAD 2 BLACK CASE COVER STAND PU LEATHER. Contents will not be affected. We process more than 60,000 products in our facility every year with our well-trained employee structure. ANY item can be optioned for pick up. Contents will not be affected. ANY item can be optioned for pick up. Local Pickup We process more than 60,000 products in our facility every year with our well-trained employee structure. When you want to protect your iPad with an attractive and functional cover, a case by Snugg is an fine choice. 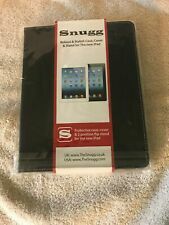 You can get new and pre-owned Snugg iPad cases on eBay. What kinds of Snugg iPad cases are available? Keyboard: A keyboard cover can make writing a breeze on your iPad, especially if you'll be sending a lot of emails. Folding: When you need a platform to rest your iPad upright, a folding model provides a practical work table that can be used almost anywhere. Shell: A Snugg iPad shell case provides a durable yet simple case. Travel: If you're planning to use your iPad on the go, a travel carrying case can be a good option. Executive: With this model, you have a place to stow credit cards, important documents, and more. What color options come with a Snugg iPad case? Snugg iPad covers come in a variety of colors, including black, white, red, pink, purple, and blue. Plus there are metallic shades available like silver and rose gold. If you are looking for something a little different, you can also find Snugg cases in camouflage and a raised square pattern. What materials do Snugg iPad cases come in? Leather: Leather cases are a durable and attractive option for your Snugg iPad case. Combo: Some cases, like the camouflage model, come in a combination of leather and canvas material. Hard plastic: A hard shell can provide excellent protection for your iPad. Silicone gel: A silicone cover can provide lasting protection for your iPad. What iPads can you cover with your Snugg iPad case? Snugg iPad cases can be used with any iPad, iPad Mini, or iPad Pro. It is important to know what size case you need. Standard sizes for Snugg iPad cases correspond with the size of the iPad not the size of the Snugg case. Snugg cases can fit 7.9-inch devices, 9.7-inch devices, 10.5-inch devices, and 12.9-inch devices. See the manufacturer site for details. Content provided for informational purposes only. eBay is not affiliated with or endorsed by Snugg.